Ambrogio is the Profine® water softener that solves all problems caused by water hardness. It removes calcium, magnesium and any sediments present in your home water. Hard water, rich in scale, produces deposits and encrustations in pipes, fittings and appliances. Ambrogio should be installed at the entance of home water supply to safeguard your home. 1. It uses water in a conscious way. lts internal intelligence system performs an automatic calculation of the exact amount of salt and water necessary for the regeneration and the cleaning of the resin. 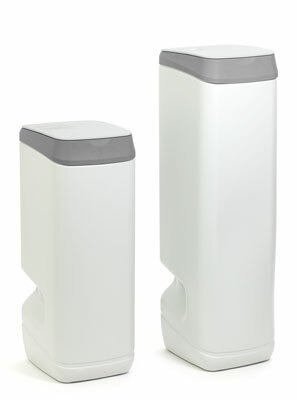 Compared to traditional water softeners Ambrogio saves of salt and water and always gives you softned water. Unique in its category, Ambrogio maximizes its performance reducing the space required for its installation. Ambrogio is able to meet the needs ranging from studio to apartment building, regardless of the number of people. Whatever quantity of water you need, Ambrogio knows how to work with water and salt. It uses them only for the litres of water you actually used. Its intelligent management allows it to dimensioned itself independently depending on the application. Design to meet the needs of the family, Ambrogio is the most efficient product to soften water in your home. Ambrogio performs an automatic calculation of the exact amount of salt and water required for regeneration and the cleaning of the resin. Its automatic counting system saves of salt and water and always gives you softned water. Never run out of Softened Water!